Nestled in the great stone and brick Albert Dock, amongst the museums and bustly eateries, is Gusto: an elegant and spacious bar and restaurant serving up everything from brunch to Italian favourites and meat and seafood dishes – and don’t even get me started on their desserts menu (Nutella and mascarpone calzone could well be my undoing!). 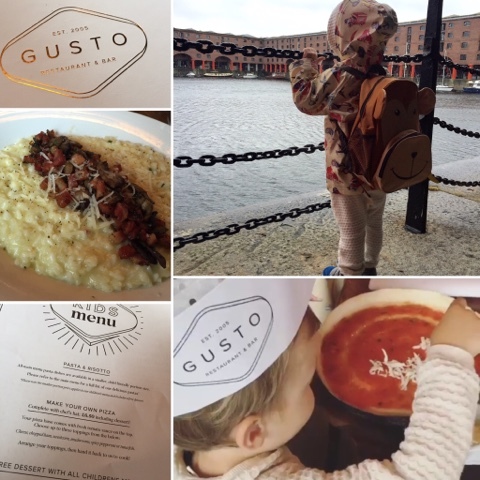 We headed to Gusto for an early lunch on a wintry August day – pouring with rain, blustery winds, and thoroughly miserable. We were practically blown into the restaurant from outside and were seated straight away so we could begin to warm up and relax the moment we took our raincoats off. We weren’t in a rush, and over lunchtime the tables started to fill up with visiting tourists, dating couples of all ages, family groups, and ladies who lunch. We sat near the window, prime for people watching and overlooking the dock basin where we could see boats’ soggy flags being whipped around in the wind and sodden passers-by envying our warmth and comfort. Not that I’m smug or anything..! The background music is quiet and adds not detracts from the ambience – it’s that fine balance of having enough of a backdrop to encourage bustle without people having to strain to talk over a noise. Two year old Primo was quite happily settling in with crudités and freshly squeezed orange juice – you know that really tasty orange juice you rarely get? Yeah that. He wanted a fruit shoot though so the lovely OJ was entirely wasted on him and he was given water instead. I went for soft drinks because as you know, I am an incredibly responsible adult in every way – although given that we were heading to Mattel Play! straight after lunch, perhaps I should have hit the hard stuff. I chose – very uncharacteristically for me – the Grana Padano risotto. It’s uncharacteristic because as old as I am, I’ve always maintained I don’t like risotto. Unfortunately this is clearly a reflection of my mum’s cooking which seems a bit unfair because she’s a wonderful cook but you know there was always that one tea you hated? Well risotto was mine. Or the time Loyd Grossman packed in Through the Keyhole and started flogging jars of rather iffy chicken tikka masala – that was also quite a dark period in our family kitchen. Consequently I’ve never ordered risotto in restaurants and only now have I realised what I’ve been missing out on. So, deciding to be a big girl and also wanting something comforting on a miserable day, I decided to give it a whirl. Topped with crispy pancetta, perfectly sautéed mushrooms and just the right amount of truffle butter, this was my risotto epiphany. I haven’t stopped thinking about it since, and want to try making it at home where I’m sure I’ll ruin it for myself and go back to never eating it again. As for young Fussy Pants, I knew I couldn’t go wrong with pizza. But not just any pizza – oh no – this was Make Your Own Pizza! Luckily the dough was already made and ready with its tomato base on, so that he could put his toppings on. We chose double mozzarella and ham, and these were brought to our table by our server along with a little paper chefs hat which was just the cutest thing ever (once I persuaded him to wear it, that is). There were a few other children eating with their families who gave him a knowing smile as he took his newly topped pizza up to the kitchen and handed it over to the friendly chef. It’s like they were all in their own little pizza gang, and Primo was really pleased with himself. He played nicely with some cars back at our table while we waited for it to cook, then once I’d polished off my risotto I helped him eat his pizza – all in the name of research of course! The tasty dough made it much nicer than the ones we make at home and he still cleverly left enough room for some ice cream. The pizza making is available until 6pm every day of the week and I wouldn’t hesitate to take Primo back time and time again to do it. It gets the kids involved in their food and also breaks up the time that they have to sit still in their chairs. There’s exceptionally clean baby change facilities in the ground floor disabled toilet towards the back of the restaurant. The restaurant is really quite big and although we didn’t bring a pushchair (we parked in one of the nearby Albert Dock car parks) I seem to think there would have been ample room to park one near our table, at least during quiet times. The staff were so friendly to both of us and our lovely server was just the right mix of attentive but not pushy, while the restaurant itself pulls off that tricky balance of being stylish and still very much down-to-earth. We weren’t rushed or overlooked in favour of adults-only diners or big spenders, which I sometimes feel can happen when you’re eating out alone with a toddler. It’s a tough gig working in hospitality and I know this from my own experience, so little things like one of the busy waiters kneeling down to ask Primo about his pizza on his way up to the kitchen mean a lot. It’s so nice when people take the time to acknowledge you as people and it’s that kind of thing I really appreciate whenever I take him anywhere.